A second excerpt from the first chapter of Food Policy in the United States: An Introduction (Routledge/Earthscan), which was published in April. This book offers an introduction to food policy in the United States. Food policy encompasses laws, regulations, decisions and actions by governments and other institutions that influence food production, distribution and consumption. While food policy is defined broadly, a food program is a more specific institution that provides or distributes food. Food policy is intertwined with many of the fundamental economic and social decisions of the day. Will traditional farming in the United States disappear as an economically viable way of life? Can U.S. agriculture contribute to nourishing a growing world population without destroying the environment? What labor rights do farm workers have? Does globalization help or harm U.S. farmers and food consumers? How can the safety of food be protected without imposing unnecessarily burdensome rules and regulations? What can be done about the epidemic of obesity and chronic disease? How can school lunches be improved? Why do some families go hungry in such a rich country? 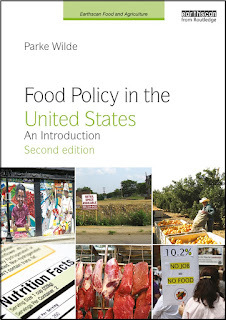 U.S. food policy is an important topic for readers in the United States and also in other countries. The United States is the world’s largest exporter for some crops and a leading importer for others. The U.S. government position carries considerable weight in multinational policy decisions about globalization and international trade. Consumers around the world aspire to emulate some aspects of U.S. consumer culture, even as doubts arise about the nutritional merit and environmental sustainability of U.S. food consumption patterns. Some environmental constraints on U.S. agricultural production are local, but others are global. In these respects, the implications of U.S. food policy extend beyond national borders. This book focuses on national-level food policy in the United States, but there are similarities with policy-making at other levels of government and in other institutions. Federalism refers to the division of authority between the national government and state and local governments. Policy innovations may be first attempted at the state and local level and later adopted at the federal level. U.S. food policy is absorbing in part because it is dysfunctional. Just as other areas of politics in the United States suffer from partisanship and deep regional and cultural divisions, food policy can become mired down in bitter struggles across stagnant political lines in the sand. On topics ranging from genetically modified organisms (GMOs) to advertising that targets children, it can seem as if no policy actors have either changed their mind or persuaded an opponent in the past generation. Faced with such challenges, it may be worthwhile to climb down from the ramparts and devote some time to reflection and study. To some extent, this book is a descendant of hefty agricultural policy textbooks such as traditionally were used in departments of agricultural economics in U.S. land-grant universities, but there are important differences. This book tackles both normative questions (about how decisions should be made) and positive questions (about how decisions actually are made) in U.S. food policy. Throughout the book, real-world policy struggles provide the contemporary hook to motivate the reader’s attention to the more specialized details of economic principles, policy analysis, institutional structures and data sources. The study of these more academic topics may pay off even for readers whose primary interest is the policy arena. The hope for this book is that these principles and data sources hold some promise for knocking loose the logjam in policy-making.